The number of Thai dishes and food is mind boggling, but if you have an idea of what you’re looking for you will leave Thailand with some fantastic culinary experiences to talk about, and maybe even a dish or two that you can make at home to impress friends and family. When you’re in the Land of Smiles I highly recommend that you try each of these awesome dishes at least once. 1. Phad (sometimes spelled phat) Thai. This dish is a favorite among foreign visitors and when you taste it for the first time you’ll immediately understand why! Invented by a Chinese-Thai chef back in the 1930’s, you’ll find this in any Thai restaurant, but the best is almost always found in a street food stall or a small ‘hole in the wall’ restaurant that stakes their reputation on ‘their’ version. Usually available with a choice of chicken, pork, shrimp/prawn, or vegetarian. I don’t think I have ever seen it offered with beef. Sometimes it even comes with an egg wrapping (like this one). I had this egg-wrapped shrimp phad thai (above) at the women’s prison restaurant in Chiang Mai. Well worth a visit if you’re in the city looking for a good, inexpensive lunch. The outdoor food court at Chiang Mai Gate (right on the moat) is also home to a vendor that makes the best seafood Phad Thai I have ever eaten. I don’t have a photo of the stall, but it’s on the outer edge, and it says something like “Seafood Phad Thai” on the sign. However, here’s a photo of the dish. I loved the fact that they served it on a glass plate with ‘real’ cutlery. The tablecloth was a nice touch too. I think this one sold for about 40Baht a plate. 2. Moo Ping (moo=pork (crazy, eh?) and ping = grill) I fell in love with these morsels of marinated, grilled goodness when I was in Chiang Mai a couple of winters ago. Most Thai’s will buy their moo ping with sticky rice. That’ not my style. I am only ever interested in actual moo ping. No rice means more room for the good stuff! My first introduction to Moo Ping was at a morning stall that would be (and probably still is) lined up around the corner seven days a week from about 7am to 11am. This particular stall is on one of the streets off of busy Huay Kaew Road, just outside of the old city. For those of you who are not into spice, this is a perfect Thai food for you… NO SPICE. You can find moo ping stalls anywhere, early morning or late afternoon, and I have never had bad moo ping! When I first started buying my moo ping here each skewer was 3Baht. A few weeks later they raised their prices to 5baht. The owners were most apologetic, and even made each one larger! Grilled pork on a stick in Chiang Mai. These would be great for a summer barbecue. Check out highheelgourmet.com for the perfect moo ping recipe. 3. Khao Soi. Although you can find this coconut base noodle dish anywhere in Thailand, its origins are in the north. 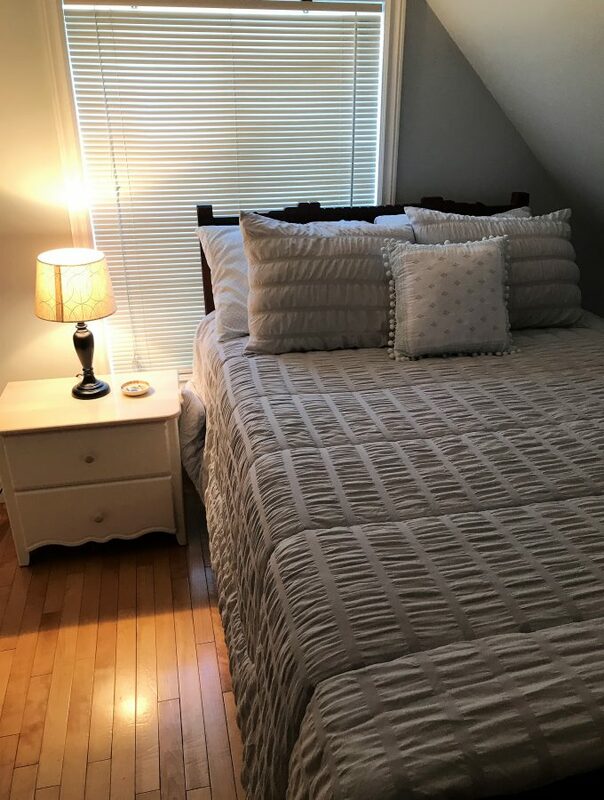 This is where you will find the best. Khao Soi is a very unique curry based noddle soup. Usually available with a choice of chicken (my favorite), beef, pork, or no meat, the optional condiments… lime, shallots and crunchy green pickles provides a palate pleasing contrast coconut based broth and the soft wheat and egg noodles. The broth can be quite spicy, but many places hold the spice and you can do it yourself. If you don’t want spicy, just ask, and you will probably be accommodated. I’ve eaten a lot of awesome Khao Soi over the years, and one of the best is at the food court at Airport Plaza. Any Songthaw driver will take you there for 15 baht. Then head for the lower level. Follow the signs to the food court. MacDonald’s is on the left, and walk straight by. You will see the large khao soi stall front and center. The tiny, low stools are not for the faint of heart! I think this past winter I paid about 40Baht for a huge bowl of this Thai goodness. Don’t forget to take your dishes to the wash area! It’s almost time to eat! Delicious Khao Soi at the Airport Plaza food court. 4. Som Tam (Spicy Green Papaya Salad). This is hands down one of my favorite Thai dishes, but let me warn you if you aren’t careful you can end up with enough spice to think that the top of your head is going to explode! The secret is to keep the number of birds eye chili to a minimum. You have to remember that the dressing already contains its fair share of spice. The salad maker will always ask you how many bird’s eye. If I am feeling really adventurous I ask for 3, knowing that I am in for one over the top hot taste sensation. Sometimes, I’ll only ask for one. If you’re not into spice, definitely say NONE. Your standard Som Tam salad contains green papaya, long beans, tomatoes, lime juice, garlic, fish sauce, palm sugar, roasted peanuts. dried shrimp, and sometimes brined or blue crab, and of course don’t forget the bird’s eye! I’ve had som tam in many different areas of Thailand, but since I spend so much time in Chiang Mai most of my som tam experiences are in my favorite city. My favorite Som Tam maker, and I have written about him before, is tucked into a short little street in Chinatown brimming with authentic Thai. My nickname for this street of Thai goodness is ‘Street Food Alley”. Honestly, if you are in Chiang Mai run don’t walk to the small Chinese Temple in Chinatown, and order one of everything! Back to the som tam…this one is simply the best. Be aware, som tam salad is always made with a mortar and pestle. The best mortars are made from stone, and the pestle usually from wood (although I have seen stone pestles too!) Did you know that Som Tom salad made CNN’s 2011 list of “World’s 50 Best Foods”? It came in at 46. The best in Chiang Mai! 5. Thai Curry (gaeng phat). I love any kind of Thai curry…red, green, yellow, masaman, panang (and probably some that I don’t even know exist). The secret to Thai curry is the paste. Every Thai cooking class I have ever taken teaches you how to make a curry paste. Once again, the mortar and pestle are center stage, and it can take a lot of strength to mash and mix the paste to just the right consistency. It’s not uncommon for Thais to buy their ‘homemade’ curry paste from a shop. I visited this curry shop with the Taste of Thailand food tours. The shop has been in business at least 20 years and they sell out daily by noon! I also got to make (and eat) an awesome green curry (gaeng khiaw waan) this winter when I took a class with Poo at her cooking school in Bangkok. This was a far cry from traditional Christmas Day fare, but amazingly good and so much fun. There’s a lot to be said about doing something different on the holidays. And this was a twist on massaman curry that I tried at Angel’s Restaurant in Chiang Mai. The crepes look like they could be a bit soggy, but trust me, they were perfect! For anyone who avoids spicy food, massaman curry is for you. Sweetness, prevails! 6. 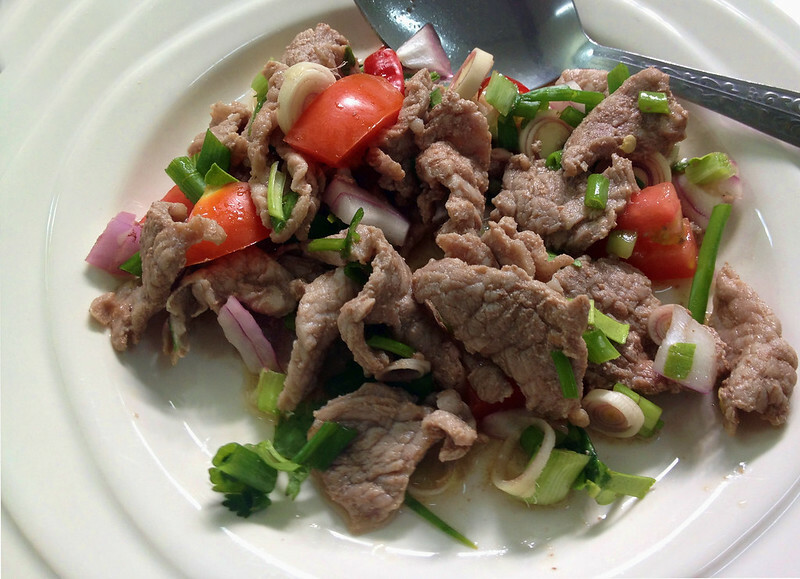 Spicy Beef Salad (Yam Neua). I love, love, love this salad. The first time I ever ate it was just this past December when I made it in Poos’ Bangkok cooking class. It was love at first bite! What a fab salad. Lime juice, lemongrass, chilies, spring onion, red onion, coriander, tomato, mint leaves and kaffir leaves are such a perfect combination. In fact, I included the recipe in the cooking class post. 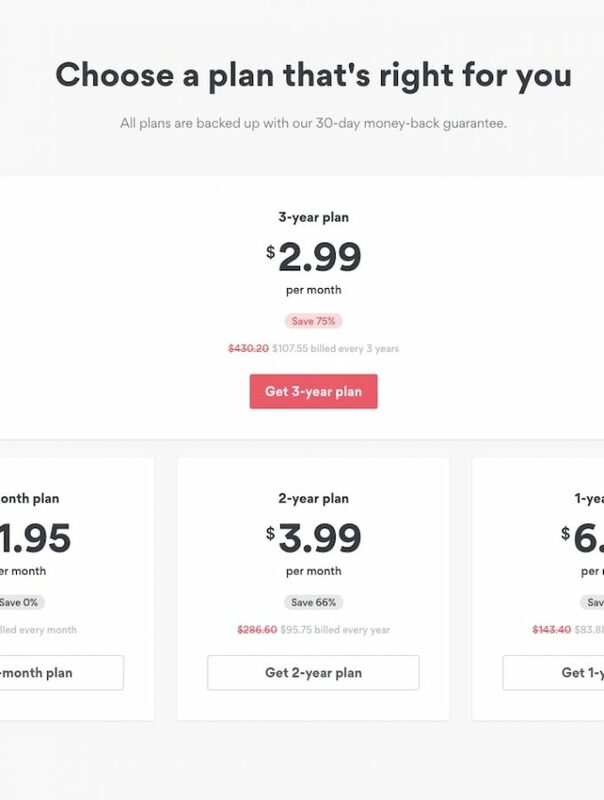 If you missed it, you might want to check it out. Just click on the link above. 7. Thai Roast Duck with rice (khao na bpet). The Thais are not alone in their love of duck. In my experience duck is popular in most Asian countries, and affordable. This is a very simple but tasty meal. Literally the roasted duck is place on top of the rice. You’ll see that the duck has a rich dark coating/sauce…so yummy. The best roast duck I have ever had the pleasure of eating was at the 100 year old Prachak Ped Yang on Bangkok’s Charoen Krung Road. You’ll in this photo that we were served the traditional khao na bpet, and also the duck over noodles (not sure of the Thai name for this). My preference is definitely the khao na bpet. 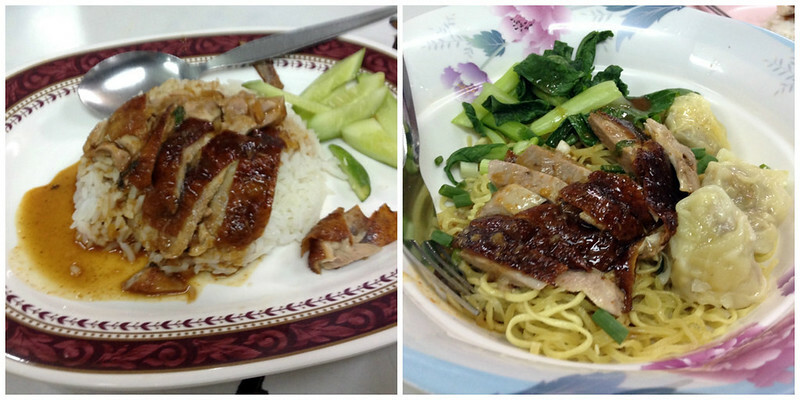 Duck is rich, and I found the duck combined with the noodles, although tasty, was just too heavy! 8. Thai Fish Cakes (Tod Mun Pla). They are sold in restaurants and street stalls everywhere in the country, and one of my favorites. I don’t think I have ever had a bad Tod Mun Pla. They normally come with a sweet Thai style dipping sauce, and often homemade! 9. Larb Moo (minced pork and liver). This Thai dish originates from the Isaan area of Thailand. It’s a simple dish with an amazing flavor. The minced pork and liver is dressed with a sauce of lime juice, fish sauce, mint leaves, onions, chilies, and toasted rice (gives it a great crunch). Served with sticky rice, this dish is usually eaten with your fingers. Available everywhere in Thailand. 10. Kao Niew Ma Muang (Yellow Mango with Sticky Rice) This is without a doubt my favorite Thai dessert, and the best I’ve had has always been from a stall. 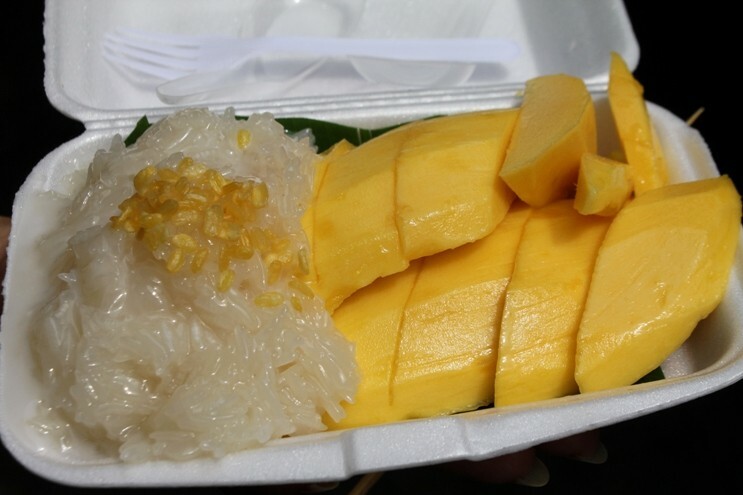 One mango sticky rice stall that I will go out of my way for is one at the Sunday Night Walking Market in Chiang Mai. These ladies have been serving it up from same location for years. The sticky rice is precooked, but the mango isn’t sliced until you place your order. Once the mango and the sticky rice is in bed together they ladle on the coconut cream syrup (no scrimping here). Always save room for mango and sticky rice! Did your favorite Thai food make my list? If you have other favorites, please add them in the comments! 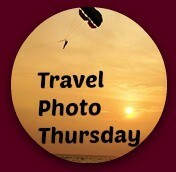 Linking up this week to Weekend Travel Inspiration over at Reflections Enroute. I love larb. These all look great, especially that curry! Hi Eileen! I could eat every one of these everyday! Yes, I love every single one of these. Thailand has amazing food. Thanks for your top 10 Thai dishes. My favourite of your list is gaaeng keow wan gai, aroi mak mak. Another favourite of mine is tom kha gai, very tasty too! My Thai wife has taught me how to cook my favourite Thai dishes, when I cook they are spiced to my taste buds only! Yum. I could easily live on Thai food for the rest of my life. I love the flavours and spices. Nancie, All this looks extremely yummy! I can’t wait to go to Thailand again and try them all! Thanks for linking up with #wkendtravelinspiration! Yummy and perfect timing. We’ve had two of these dishes so far but have also had a number of wonderful things like the special dish served only at New Year with Jasmine rice served cold – in a bowl of ice water and then a selection of toppings like fried shrimp paste is served with it. Like most people, I love Thai food – and Phad Thai is an alltime favourite – simple, fresh and available everywhere for Vegetarians. Moo Ping looks and sounds like the perfect Thai dish for me. And I\’m on a mango mission these days so sticky rice and fresh mango would be the ideal dish. I can\’t believe I haven\’t yet been to Thailand! Must go! They all look wonderful. I can’t do too much spicy, but fortunately if I try and it is too much, I have an eager husband just waiting to eat what I’ve ordered! Yummmmmy! I could eat them all. I have never seen the egg wrap, look delicious! Loved the photos! I love Thai food and all of these look delicious. After reading this, I want to go out for Thai food immediately and I just finished breakfast! Looks like you’ve really had some amazing food in Thailand. I, too, learned that even though I like moderate spice, it is considered very mild in the eyes of the Thai. I can’t imagine how their stomachs can take it! What a great article! Now I know I do not know enough Thai food. Just made four of those: phad thai, spicy beef salad, green papaya salad, and curry, of course. Got to find and try the rest. Thanks!! 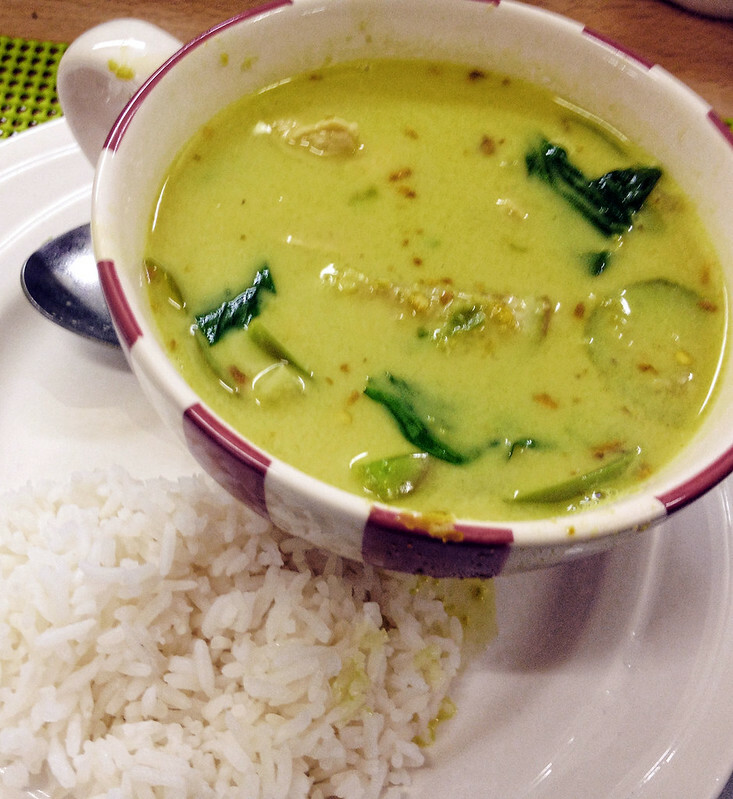 I love Thai food – especially the many curry dishes. You’ve really done your homework! I have to admit that eating from street vendors has always concerned me for hygiene reasons but it doesn’t appear that you’ve had issues from doing it. Maybe it’s time for me to reconsider! Lovely photos. I never tire of SE Asian food. I’d love learn more about cooking Thai food, but I’ll settle for eating it. It’s Thai New Year, so I’m thinking about heading out for some Thai food. I made some awesome Mango Sticky Rice in my Malaysia kitchen once, but I fear that I cannot recreate it quite as successfully with the ingredients I find in Texas. I have been eyeing the papayas at the market, though, hoping to find one green enough to attempt making Som Tam again. I also like the fish cakes, pad thai, and any curry. I’m not sure if I’ve had the grilled pork skewers and clicked over to the recipe. I’m intrigued what it tastes like since condensed milk is part of the marinade. Ok, I’m hungry now. Lovely round up of Thai food. I’ve never had the egg wrapping before looks really interesting! I love them all, and starving right now, must get myself some dinner. I am woefully lacking in Thai food experience, but I’m definitely starting to crave it looking at these pics. I know that I’d like the grilled pork on a stick, for sure. Oh yes I remember most of those dishes, oh sooo good and I love the dessert with the mango and sticky in the end – but it needs a dollop of coconut ice cream! I want them right now they look so juicy. even i can live my rest of my life by eating Thai food . these are so delicious . cant control myself. Even Thai ingredients are awesome. I know it’s touristy, but I can resist to a good Pad Thai, they don’t do it anywhere as good as in Thailand. I’ve just came back but I already want to return!